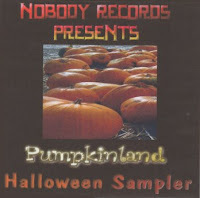 Here is a FREE MP3 download of if...(click here to download) (link disabled) taken from the Nobody Records Pumpkinland Halloween Sampler (also found on Instrumental mopehead). When I listen to this song I feel a lonely sense of longing...a certain kind of sadness that speaks of a very tough time when it felt like all was lost. 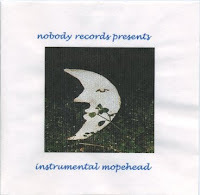 Songs like this express the mopehead that I am. Never mind the Christmas junkies who fantasize about hanging icicle lights on Thanksgiving before the turkey is carved. They've got nothing on the Halloween freaks, in whose ranks, I confess, I am now permanently entrenched. Long before Labor Day, I was making papier-mache witch heads, shopping online for everything from bat skeletons to glow-in-the-dark rubber brains, and scouring Internet chat groups for tips on how to make soil-less grave mounds. It started out innocently with a few strings of pumpkin lights. Then I discovered the secondary market in anatomical displays. Medical-school skeletons with misaligned femurs don't get sent to the dust heap. They are marketed to "haunters," as do-it-yourself fright-makers are called.